QR Codes connect print and digital. Quick Response (QR) Codes are barcodes that are optically machine-readable and can contain various types of information. QR Codes were initially used for tracking parts in vehicle manufacturing. Now, QR Codes are used in a much broader context, aimed at smartphone users. QR Codes can be used to display text to the user, to add a vCard contact to the user’s device, to open a URL or to compose an email or text message. QR Codes storing addresses and URLs may appear in magazines, on signs, buses, business cards, or on just about any object about which users might need information. Users with a camera phone equipped with the correct reader application can scan the image of the QR Code to display text, contact information, or open a web page in the phone’s browser. This act of linking from physical world objects is known as a hardlink or physical world hyperlinks. QR codes have become more prevalent in marketing circles and have been integrated into both traditional and interactive campaigns. 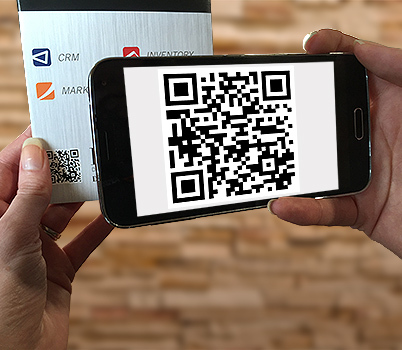 Media where QR codes have been deployed include: billboard ads, in-store displays, event ticketing and tracking, trade-show management, business cards, print ads, contests, direct mail campaigns, websites, email marketing, and couponing just to name a few. QR codes are of particular interest to marketers, giving them the “ability to measure response rates with a high degree of precision” allowing for easier ROI (return on investment) calculation, thus helping justify spending on marketing budgets. QR codes have also been used at trade shows and in conferences. PURLs (Personal Uniform Resource Locators or Personal URLs) are web pages (also includes mobile web pages) that are personalized for a specific individual. GURLs (General Uniform Resource Locators or General URLs) are web pages that are set up for anyone to visit. What sets this type of page apart from a typical web page, is that it is designed to capture data. A PURL begins with a database of known recipients and marks when that person uses their PURL and captures any information the visitor has been asked. GURL web pages are used to gather information from people that are unknown. This type of page will typically ask you for your name and email address. These pages are typically part of a campaign, but can be used in conjunction with QR Codes to gather information or relate information on just about anything.